Arctic sea ice is under attack from all sides. At this time of year, the sun doesn't set at the higher latitudes. 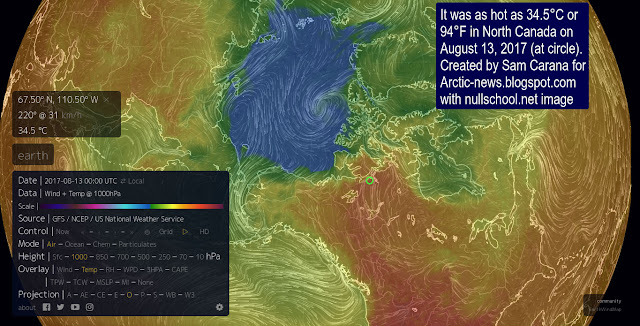 As the image below shows, it was as hot as 94°F or 34.5°C in North Canada on August 13, 2017 (at the green circle, at 1000 hPa, at 00:00 UTC). Temperatures at surface level were as high as 33.1°C or 91.5°F at that location, where wind was coming from the south and blowing toward the north at a speed of 28 km/h or 17 mph at that time. Above image shows cyclonic winds over the Arctic Ocean pulling warm air from North Canada over the Arctic Ocean, while pushing cold air out. Winds and rain have been battering the sea ice for some time now, as discussed in an earlier post. 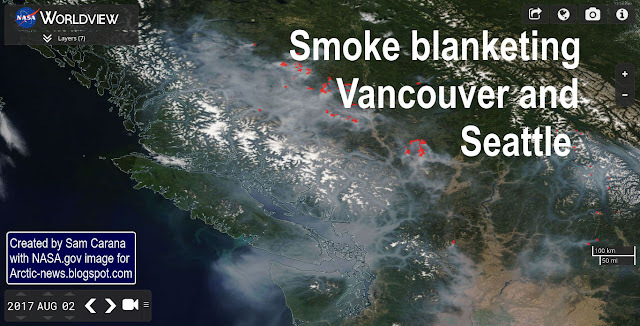 Fires are becoming more devastating, as discussed in an earlier post. The August 2, 2017, satellite image below shows smoke from fires in British Columbia blanketing Vancouver and Seattle. 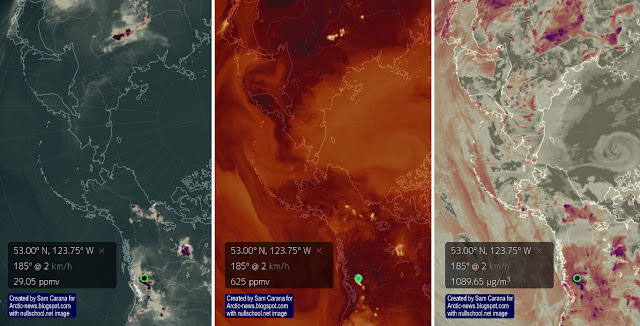 Carbon dioxide (CO₂) levels were as high as 527 ppm, carbon monoxide (CO) levels as high as 12.59 ppm and sulfur dioxide (SO₂) levels as high as 490.77 µg/m³, as these images show. The combination image below shows forecasts for August 8, 2017, 13:30 UTC. CO levels were forecast to be as high as 29.05 ppm, CO₂ levels as high as 625 ppm and SO₂ levels as high as 1089.65 µg/m³ (each time at the green circle). 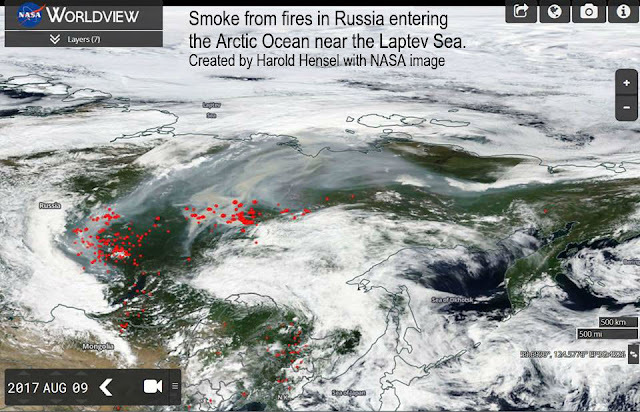 Also note the emissions from forest fires in Siberia. 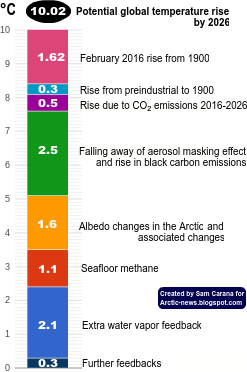 Actual levels were even higher at that spot on August 11, 2017, when CO was as high as 30.97 ppm, CO₂ was as high as 633 ppm and SO₂ was as high as 1150.19 µg/m³, as illustrated by the image below. 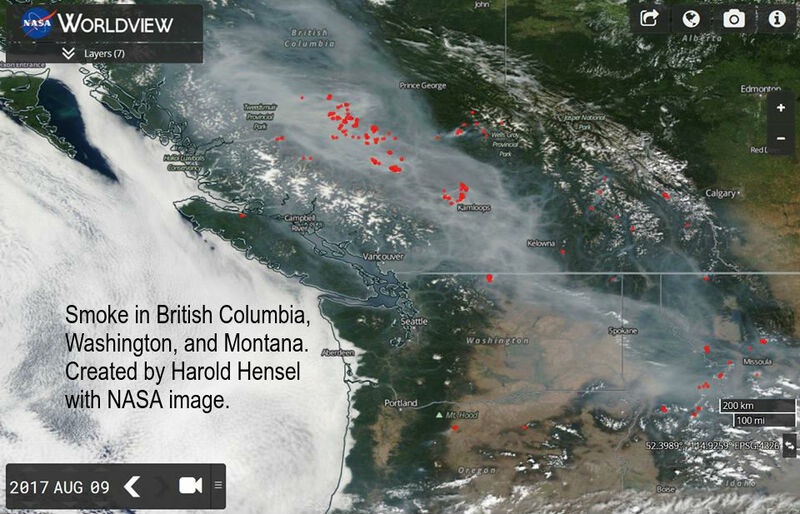 The image below, by Harold Hensel, shows smoke over British Columbia, Washington, and Montana on August 9, 2017. 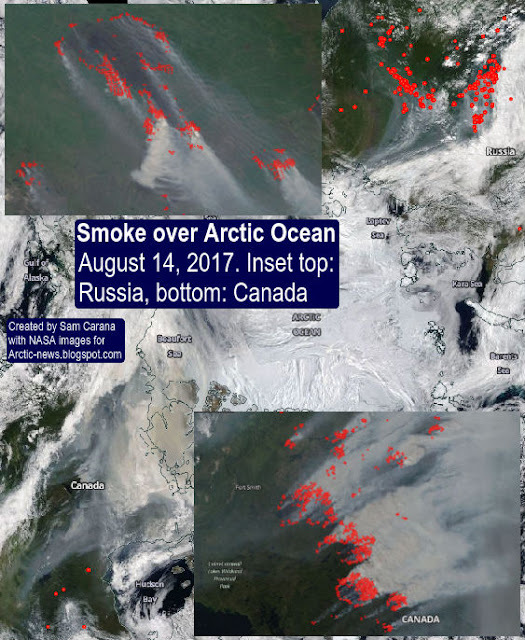 Winds can carry smoke from forest fires over long distances, all the way to the Arctic sea ice, where the soot can settle and darken the ice, thus speeding up its decline. The image below, also by Harold Hensel, shows smoke from fires in Russia entering the Arctic Ocean near the Laptev Sea on August 9, 2017. The image below shows the situation on August 14, 2017. Canadian wildfires caused PM10 to reach levels as high as 11,599 μg/m³ on August 16, 2017, at the location marked by the green circle. 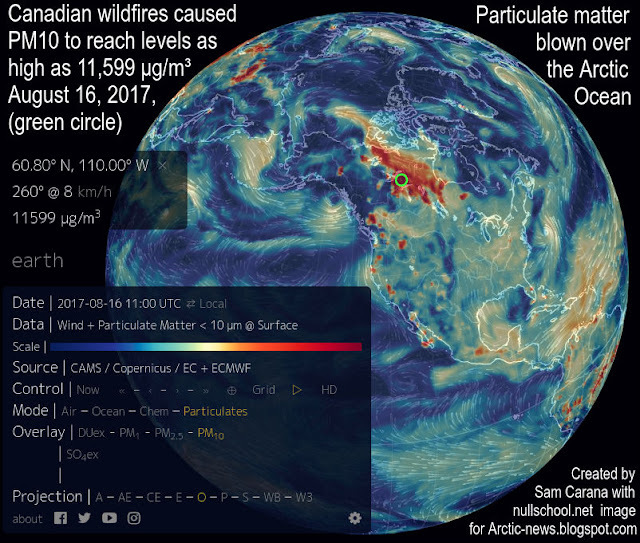 The image below shows PM10 getting blown over the Arctic Ocean. The thickest sea ice in the Arctic Ocean is located close to the north of Greenland and the Canadian Archipelago. This ice is now breaking up, due to high temperatures and strong cyclonic winds that cause warm rain, high waves and strong sea currents. 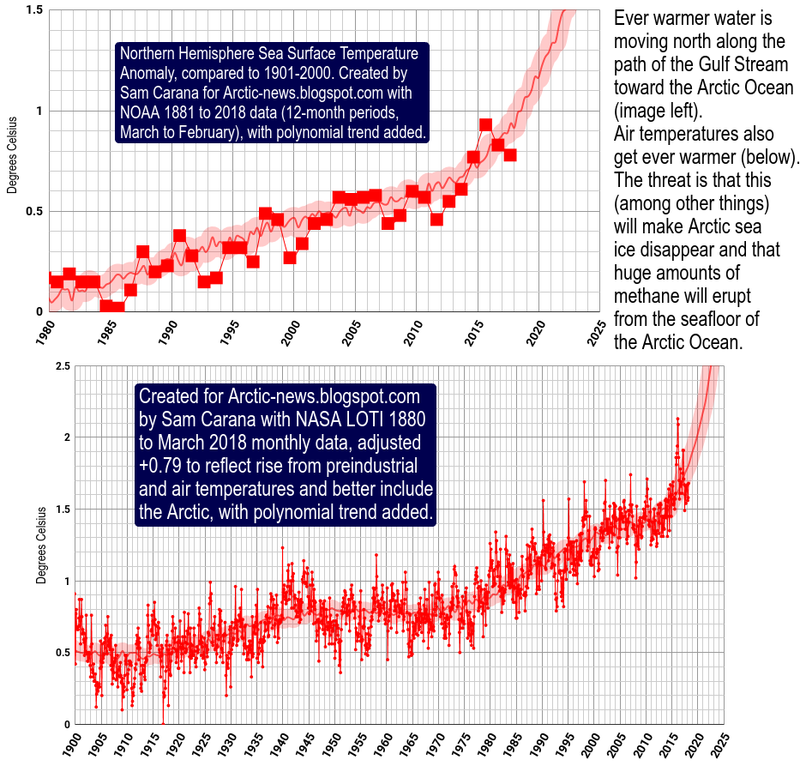 Watch the thickest sea ice break up on the animation below. This is a 17 MB file, so it may take some time to fully load. Click here if you do not see the file appear below. 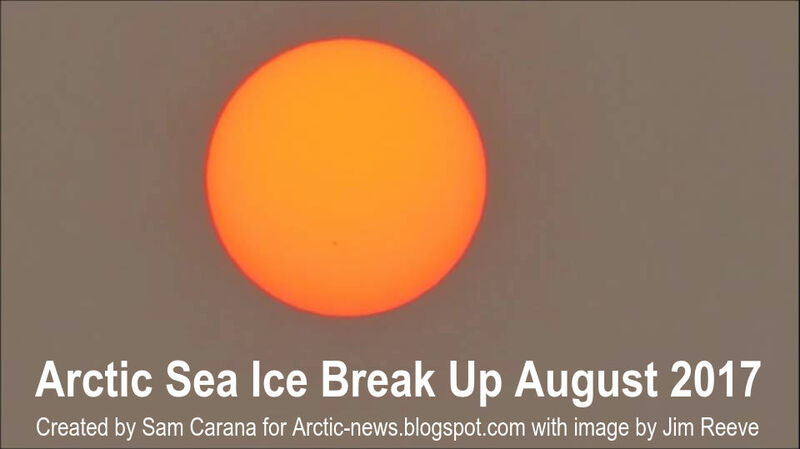 The animation below shows the thickest sea ice breaking up between July 14, 2017, and August 13, 2017. The situation is dire and calls for comprehensive and effective action, as described at the Climate Plan. Wow. I guess this is it. I guess this set of living arrangements is truly over. It's one thing to talk about it all the time, but to really at the end-finally-is truly numbing. Nice Job Sam; how many more days of primetime melt are left? Arctic sea ice extent typically reaches its minimum extent in the third week of September, but volume is likely to keep falling until well into October this year.